Written by 6/9/2009Share this story on Facebook! 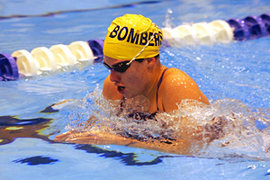 Women’s swimming and diving team member Lauren Botterbusch ’10 was named Empire 8 Swimmer of the Year for 2008–09. She was a four-time All-American at the 2009 NCAA Division III Women’s Swimming & Diving Championships, the Swimmer of the Meet at the 2009 Empire 8 Championships, and a five-time Empire 8 Swimmer of the Week honoree. She recently finished third in the 100-yard breaststroke at the NCAA Division III Women's Swimming & Diving Championships with a time of 1:03.87 in the championship finals, earning first-team all-America honors. Swimmer Antoine Connors ’12 was named Empire 8 Rookie of the Year for 2008–09 after also earning Rookie of the Meet designation at the Empire 8 championships. He won the 50-yard freestyle and 100-yard freestyle at the Empire 8 and Upper New York State Collegiate Swimming Association championship meet, and was part of Ithaca’s 200-yard freestyle relay team that won conference and state titles. Connors currently holds the school record in the 100- yard freestyle and 50-yard freestyle. The Bombers finished second overall in the Upper New York State Collegiate Swimming Association and Empire 8 standings, set three school records, and made five NCAA B provisional qualifying standards during the championship meet. The second-place finish in the association standings is the Bombers’ highest since they won the meet in 2004. Watch the Bombers dunk, serve, dive, and sprint their way through the season in our Fuse photo galleries. Ithaca Athletics wrapped up the academic year with IC freshmen taking Rookie of the Year honors in swimming, wrestling, and track and field. Seth Ecker ’12 has been named Empire Collegiate Wrestling Conference (ECWC) Rookie of the Year. He earned all-America honors at the NCAA Championships, won the season-opening Ithaca Invitational, and was named the meet’s Most Outstanding Wrestler, earning Wrestler of the Week honors from the ECWC and D3wrestle.com. He later won the ECWC title to earn an automatic bid to nationals. Bombers athletes swept the Empire 8 women’s indoor track and field awards. Marcia McCord ’11 won her second straight Track Athlete of the Year Award, while Emma Dewart ’12 was named Field Athlete of the Year and Rookie of the Year. McCord won Empire 8 titles in both the 55- and 200-meter dashes. She was named Track Athlete of the Meet at the New York State Collegiate Track Conference Championships, where she won the 55- and 200- meter dashes, as well as the long and triple jump, and was ECAC champion in the 400- meter dash. 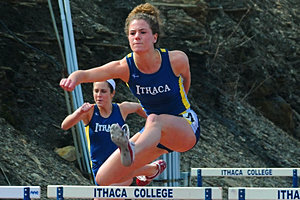 During the 2008–09 season, she set four Ithaca records in the 60-meter dash, 300-meter dash, long jump, and triple jump. Dewart won the pentathlon at both the NYSCTC and ECAC championships and garnered all-state accolades in the 55- meter dash, 55-meter hurdles, long jump, and high jump. The Ithaca gymnastics team placed fifth in the team portion of the National Collegiate Gymnastics Association Division III Championships and three Bombers combined to earn five individual All-American honors. 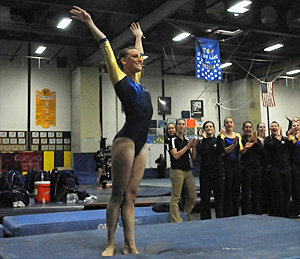 Jessica Bolduc ’12 placed fourth in the all-around competition, the fourth-highest score in Ithaca history. Bolduc finished second on the uneven bars. She is the first Bomber to earn All-American in the all-around competition. Kiera Duckworth ’10 flawlessly balances her sport commitments with her outstanding scholarly achievements. Duckworth is the goalie for the women’s lacrosse club sport team at IC. A sociology major, Duckworth joined the team without any previous experience in lacrosse and says that she has learned literally everything she knows from her teammates. Although she has no present plans to play on the Bombers varsity team, Duckworth, feels she is well equipped to do so thanks to her experience at the club level. Club sports offer a friendly and enthusiastic environment for anyone who is interested in participating. Duckworth is not only a committed athlete but a dedicated student as well. She earned opportunity to present and the Sport, Sexuality, and Culture Conference, hosted by Ithaca College this past spring. Her presentation was titled “Balls, Bikinis, and Bigotry: Exploring Gender and Homophobia in Sport." The presentation explored gender issues in sport that show how the interactions of homophobia, heterosexism, and sexism all reinforce one another under the assumed gender binary in the world of sport. The experience of presenting was “amazing,” she says, especially since the people that she cited in her paper, such as Eric Anderson, Vikki Krane, and John Amaechi, were also keynote speakers at the conference. Duckworth is currently continuing her research with sociology professor Rebecca Plante. For successfully integrated her sports experiences with her analytical intellect, and continuing on the path of a rising scholar in her field at IC, Duckworth deserves Fuse’s student-athlete kudos! Each year the Ithaca College chapter of the Public Relations Student Society of America (PRSSA) hosts its Make-A-Swish for Make-A-Wish event, engaging students in athletics to make a difference in the world around us! The Make-A-Wish Foundation is an organization that enriches the lives of children with life-threatening medical conditions through its wish-granting work. Make-A-Swish is an all-day basketball tournament open at all students for prizes. The event also includes a live DJ and food donated from local vendors from the greater Ithaca community. “As a public relations club, we want to lend a hand to help nonprofit organizations, such as the Make-A-Swish foundation, by putting our PR skills to good use,” says PRSSA member Idan Bail ’09. This year, Make-A-Swish had 12 teams participating and raised about $1,500 for the Make-A-Wish foundation. Bail says the PRSSA hopes next year to go above and beyond the success of this year’s event.